The Rugby World Cup is coming to town next week, and is one of the Rugby world’s biggest events. People will be traveling from all four corners of the world to support their team, or just to be part of the action. The Millennium stadium will be host to numerous games including half of the quarterfinal matches. Many people living close to any of the venues are thinking about letting out either a spare room in their house or their whole house, for traveling fans. With Airbnb becoming increasingly popular for holidaymakers and homeowners, letting out your space isn’t that difficult anymore. Will you need to adjust your insurance? What will you do with extra belongings? Will you put them into storage? Countless people who live on the route to stadiums will set up food and beverage stalls on their front garden. This is a simple way to make more money. You can have a stall selling barbeque foods or barbeques foods from different countries! You could even the barbeque from your back garden to cook the food. It is always best to double check with the council and other authorities that you can sell on your front garden. For food items you will need to have a food and hygiene certificate as you are selling food to the public. These items all require specific licenses, which are not easy to come by and not worth it for only a few days a year. Storage units are an ideal solution when thinking about making money during the world cup. You can store napkins and cutlery ready for selling your food. If you are thinking about letting out a room/house then storage can come in handy to keep those precious items safe while you have people living in your home. 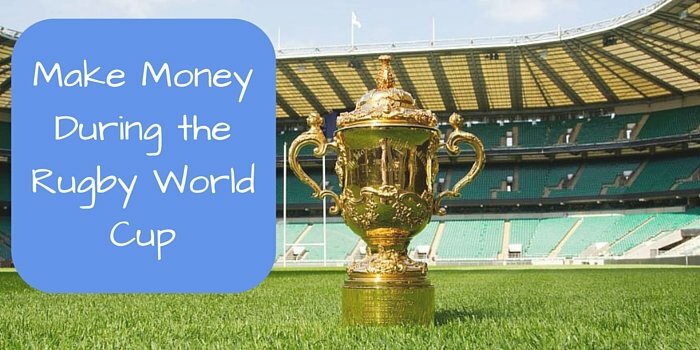 Even if you are finding a way to make money during the Rugby World Cup you should also enjoy the tournament as its not every day you will have some of the world’s best players in your town.